Drove up to the Olympic Peninsula from Eugene Oregon to Port Angeles, Washington to spend a few days in Olympic National Park. The first day we stopped at the Hurricane Ridge Visitor Center to get the lay of the land and decided to hike the Hurricane Hill trail up to Hurricane Ridge for a view of the Olympic Mountain Range. The trail was a mile and a half long switchback trail with an average time to complete of one and a half hours due to a 700 foot rise in elevation. It was tough walking almost continually uphill but we made it to the top and had a spectacular view of the mountains and surrounding area. We chose to photograph sunset at Second Beach on the last day there. The smoke took a little away form the sunset but I did get a decent shot with the large sea stack and an opening in the rocky jetty extending out from the beach. As with most of the beaches in Oregon, you have to climb over a large number of dead trees on all the beaches to get to the water. My estimate was that there was about 20 to 30 feet of logs to climb over to get to the actual beach, tough to maneuver with photographic equipment . The only other area of interest in the park was the Hoh Rainforest but there was no way to drive through the park to get there. You would have had to go all around the park and reenter from the south to get to the rainforest. We chose to save that for another trip. All in all a great experience. This entry was posted in Landscape Photography, National Parks on August 19, 2017 by admin. 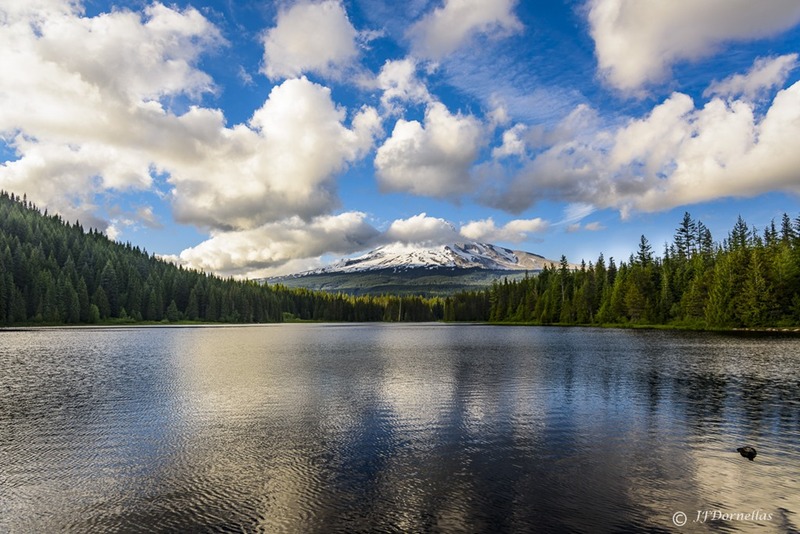 From there we went to Trillium Lake to photograph Mount Hood at sunset. It was a clear day with plenty of clouds to make the sky interesting, the only drawback was that the clouds were low and obscured parts of the mountain during the time we were photographing. The next morning was spent at the Portland Japanese Gardens which had recently been remodeled and they were spectacular. 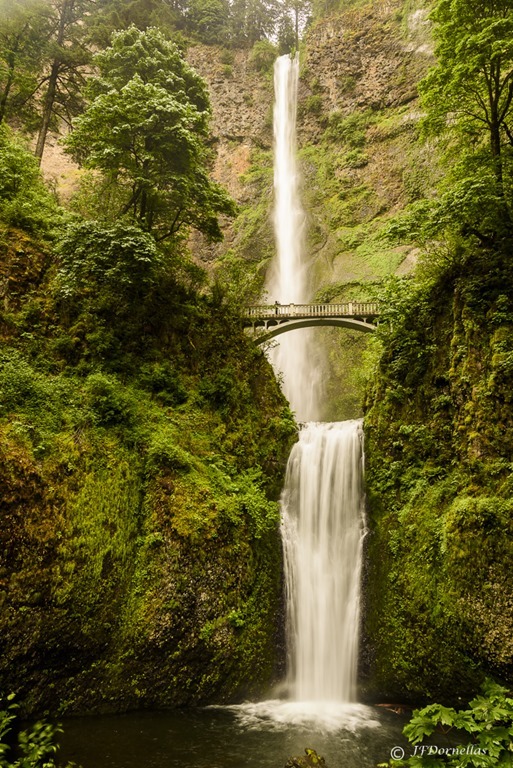 The whole experience was very invigorating, first to have an expert to help coach you on the photographic process and second to spend the time out in nature exploring and photographing some of the beautiful places here in Oregon. This entry was posted in Landscape Photography on July 22, 2017 by admin. 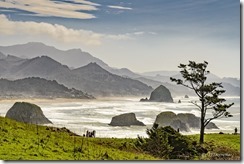 Traveled to Ecola State Park to photograph the Northern Coast of Oregon as it provides a great view of the Coast down to Cannon Beach. It was a sunny day with no rain and had a great view from the park from above on the cliffs in the park. The big disappointment was that you could not get down to the beach as I felt it would be a much more dramatic image. Mud slides had closed the trails down to the beach in the park due to a very rainy winter. Looking North at the coast it may have been a bad time to be down on the beach as it looks like high tide and I may have needed boots for wading in the water. 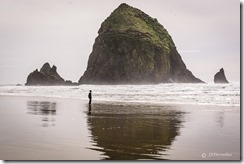 I did get down to the beach at Cannon Beach, a very popular summer destination as it is much like the beaches on the East Coast. Their big claim to fame is the huge Sea Stack out in the ocean. The boy standing on the beach gives a perfect indication of the size of this monster rock sitting out there. In all my travels on the coast huge rock formations out in the water are commonplace. 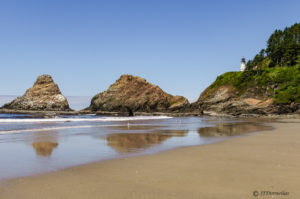 I will be continuing my exploration of the Oregon coast and checking out all the variations of rock formations here and maybe check out northern California to see if this phenomenon continues down the west coast. This entry was posted in Landscape Photography on June 1, 2017 by admin. 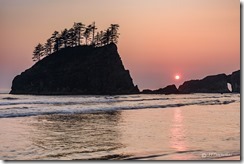 I have spent the majority of the winter traveling and photographing the rugged Oregon coast. The weather has not been at its best for a majority of the time and I sometimes find myself wishing we could swap some days with Santa Fe, New Mexico so we could give them a couple of our rainy days for a couple of their sunny days. Be that as it may it has been very interesting winter. 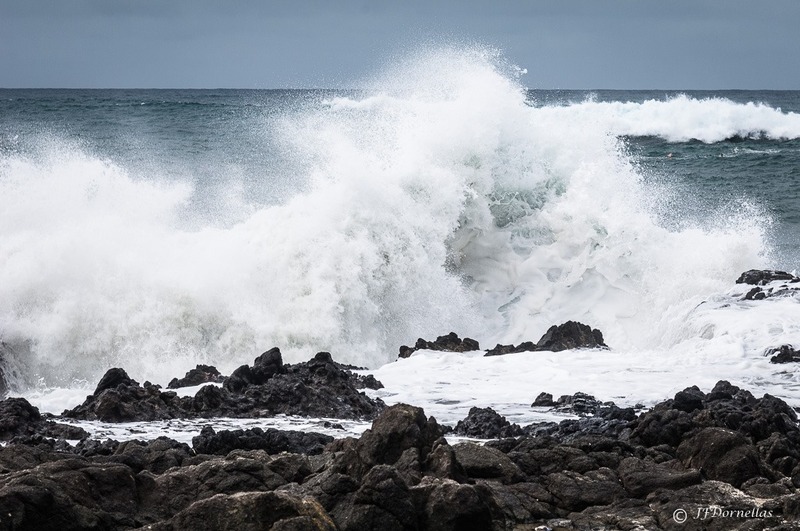 Being from the east coast with long white sandy beaches, the pacific coast here in Oregon is very rocky, rough and cold. I haven’t been able figured out yet why many of the beaches here are cluttered with driftwood logs and tree limbs it makes the beaches look ugly. One very interesting coastal area for me was in Newport Oregon while attending a Photography Club conference. They had a scheduled photo excursion for sunrise to an area called Yaquina Head with a lighthouse and a beach filled with smooth, shiny black rocks and not much sand. This area is a large nesting area for many of the native birds. It is very rugged with huge clusters of rocks out in the water as you can see below. The only thing missing was the sun. This Lighthouse image gives you an idea of what the beach is like and it was tough navigating over the rocks which were wet and slippery. 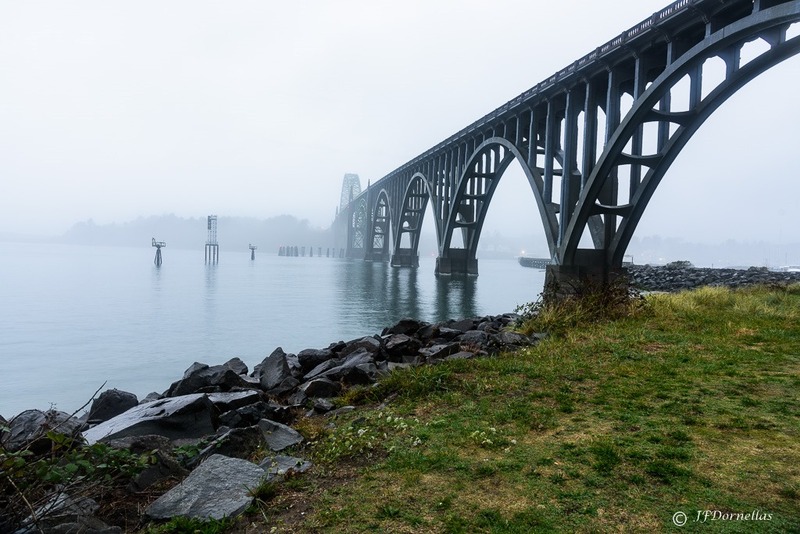 We also had a sunset tour to the Yaquina Bay bridge which again lacked sun but made for some interesting images of the bridge. 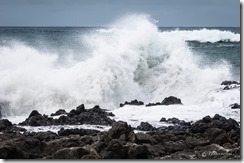 Another very interesting area that is near Newport is Cape Perpetua which is well known for the huge waves that come crashing over the rocks and if you are not careful you can very easily get drenched or worse, get dumped into the cold ocean if you are not watching for the incoming swells. While the weather is still mostly cloudy and rainy I will continue focusing on the Oregon Coast. 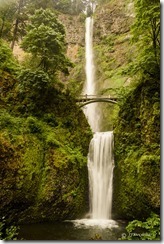 When its later in the spring I am hoping to get to Washington to photograph in Olympic and Mt Rainier National Parks. This entry was posted in Landscape Photography on March 18, 2017 by admin. I have now relocated to Eugene Oregon and it has opened up an entirely new world for my photography. The abundance of green and access to the Oregon coast provides scenery that is significantly different from New Mexico. I spent the first two months at my new residence settling in and exploring nearby areas for photographic opportunities. It will probably take several more months to get my bearings and scope out scenic areas for potential photographic trips. 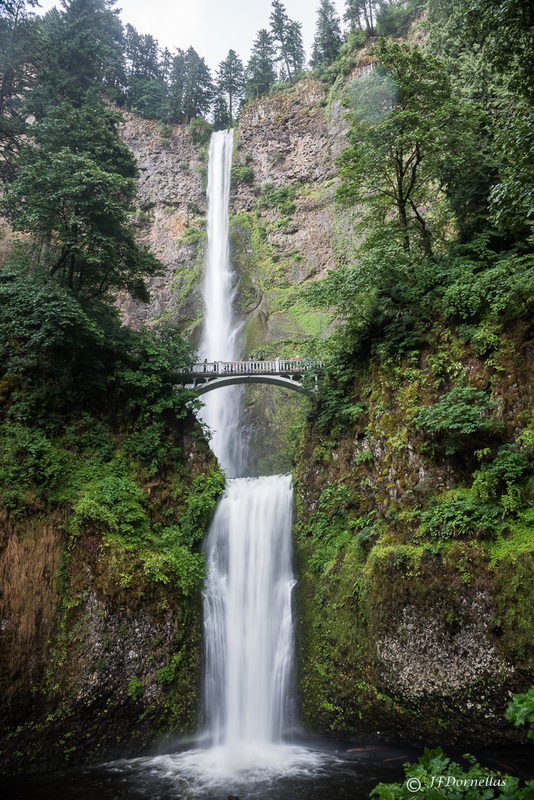 At this point I have been to three coastal areas, two waterfalls and Crater Lake National Park. To provide an idea what the nearby Oregon area looks like, I would like to share some photographs from my recent explorations of some areas that are fairly close to my location in Eugene. 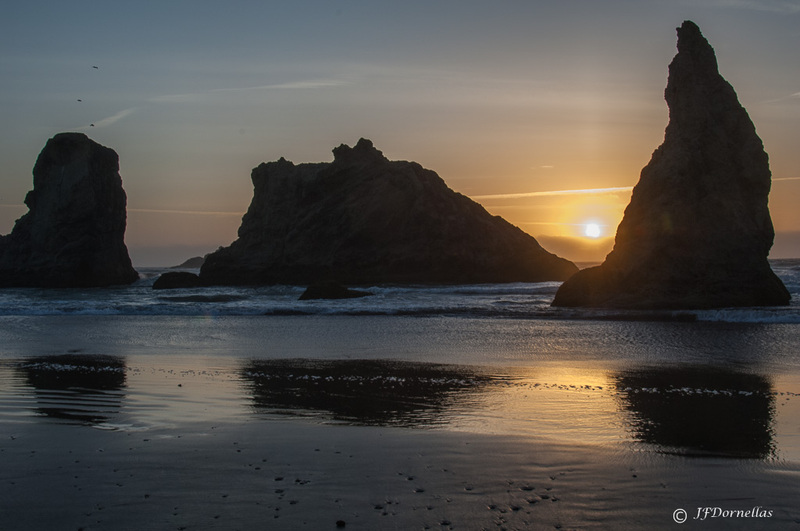 These photographs represent exploration photos which will improve significantly over the next year when I take advantage of the light from the golden hours (sunrise & sunset) and I can seek out the most advantages locations to photograph the great sites of Oregon from. I have spent the most time on the Oregon coast as it is very different from the California coast. 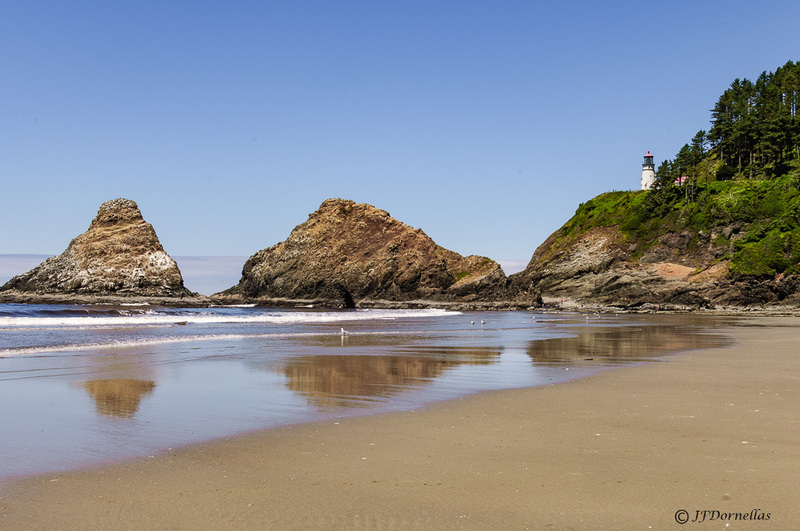 My first trip was to Heceta State Park which has one of the many lighthouses along the coast. 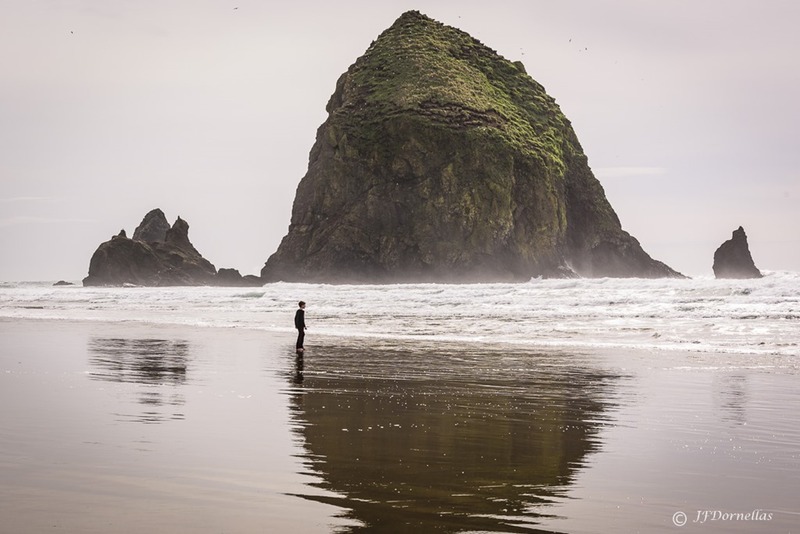 I then went to Cape Kiwanda with the huge “Haystack” rock sitting out in the water. 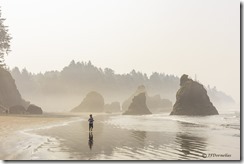 A trip to Bandon Beach made me feel as if I had just entered into a scene from Planet of the Apes with many large rocks out in the Ocean and on the beach. Oregon has hundreds of waterfalls with one location having 10 different waterfalls but my favorite so far has been Salt Creek Falls. The biggest issue with the waterfalls is getting close to the falls. The areas I have been to so far have restricted access to a position close to the falls. Finally, No images of Oregon would be complete without a photograph of Crater Lake which is spectacular. My next focus will be Fall foliage which will be sometime in September and October. I will be back at that time to share images of the West Coast foliage. This entry was posted in Landscape Photography on August 13, 2015 by admin. 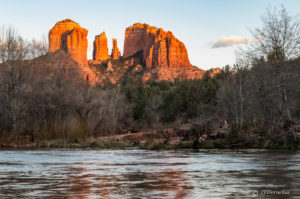 On March 9th I set out for Sedona Arizona to check out the famous Red Rock country and relax in the warm weather of that area. First stop was to capture one of the most photographed sites in Sedona, Cathedral Rock, at sunset. We managed to get to a good spot to view and wait for the sunset and it was a great clear sunny day which made things easy to get the shot. I have been here before and experienced better color but all in all it was not a waste of time by any stretch of the imagination. The next day we tried several different trails, first to Devils Bridge and then to Oak Creek Canyon, both of these were interrupted by Oak Creek which was icy cold and too deep to cross and travel the trails. 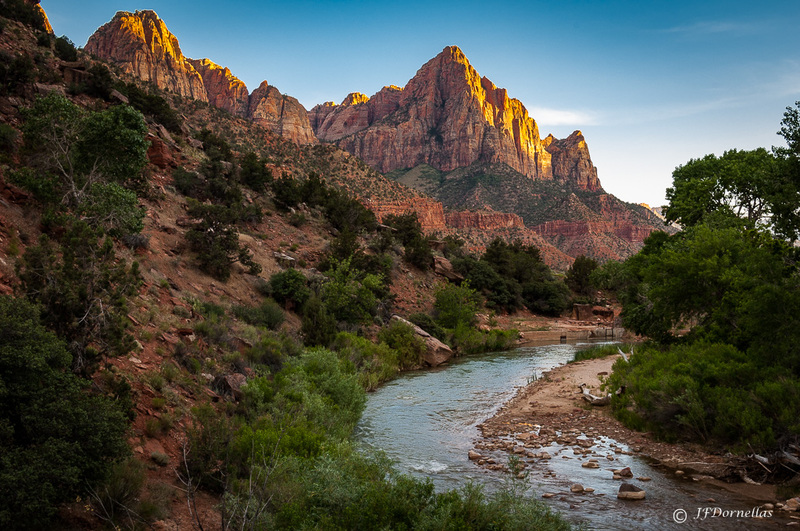 There were many hikers who tried and failed to make it on the trail so we turned back and looked for any trail which did not need you to cross Oak Creek. We finally managed to try Fay Canyon, while this was a nice hike photographing in a steep canyon does not provide much room to position yourself and get many angles to shoot from so it seemed that you were always looking up at the red cliffs and trying to get across how huge and spectacular they are. From a photographic perspective it was not anything I would rave about but overall I did enjoy the hiking and the warm weather and hope to go back again to get to Devils Bridge and Oak Creek Canyon. This entry was posted in Landscape Photography on March 25, 2015 by admin. 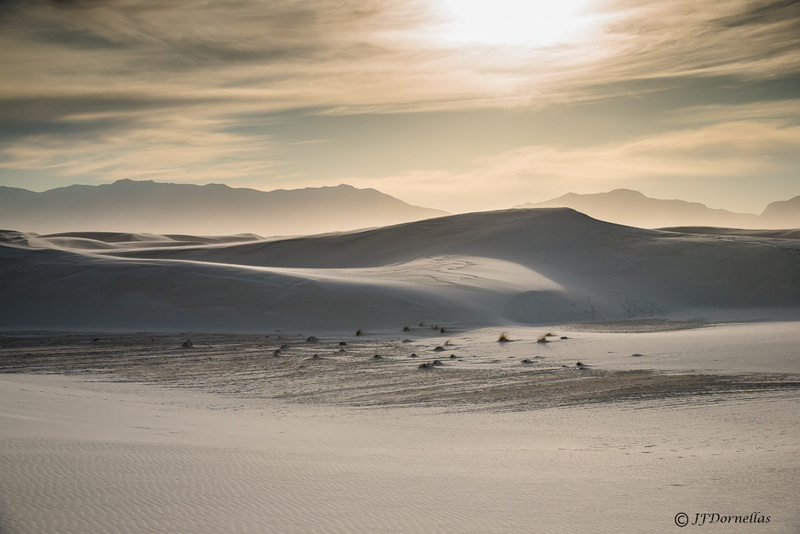 Sands National Monument in Alamogordo new Mexico. I arrived at 8:30 AM and since the Visitor Center doesn’t open until 9:00 AM, I drove along Dune Drive to check out the dunes. I discovered two of the four hiking areas, (Playa Trail and Dunes Life Nature Trail) were closed to visitors due to work being done in those areas. The Drive is only eight miles long so I checked out the scenery along the road and found that most of the dunes were being walked on and many people were sledding down the dunes. I decided the big trail at the end of the Drive, Alkali Trail, would probably be the best place to photograph during the end of the day. I would have to schedule my photography so that I could be out of the park when it closes at 6:30 PM. I would definitely come back again and focus on the Alkali Trail, bring a tripod and more than one lens. This is by far the trail to take as it is far more picturesque and I believe that sunrise must be well worth being here for. This entry was posted in Landscape Photography on March 19, 2015 by admin. 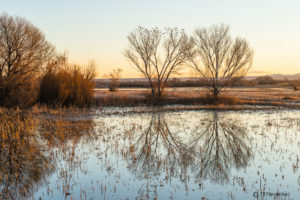 Since I had a great time and learned a lot about bird photography on my trip to Bosque del Apache, I decided to venture there again in late February (the 25th) for another chance to get more photographs of the birds. Sunrise was scheduled for 6:37 AM and I arrived at 6:00 AM only to discover that the preserve was absent of photographers and birds. I later discovered that due to a poor corn crop and frozen ponds the birds had left by the early part of January. I was faced with a few scattered ducks and Canadian Geese on the main pond by the Flight Deck. It was a calm day with a nice sunrise and I tried to make the best of the situation taking advantage of the pond reflections. and the few Canadian Geese that were available. Went back again at sundown to see if any birds might return to roost for the night but there was really nothing worth photographing. The visitor center indicated that even in a good situation most of the birds would have been gone by mid February. 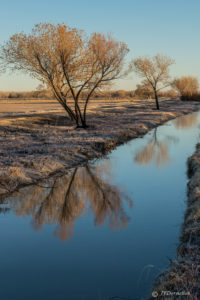 So If you want to have the best experience when Visiting Bosque del Apache first call the refuge at 575-835-1828 to check conditions there and try to go between the beginning of December and mid January. This entry was posted in Nature Photography on March 19, 2015 by admin. Bosque del Apache is a National Wildlife Refuge located near Socorro New Mexico. This was my first attempt at photographing wildlife and picking more difficult wildlife in birds. I also got the opportunity to use my long telephoto lens (80 – 400mm) which is essential for capturing birds in this environment. Prior to this trip I read as much as I could about bird photography both stationary and in flight. 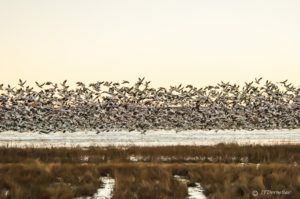 The majority of birds there are Canadian Snow Geese and Sandhill Cranes and there can be as many as a 100,000 birds at this refuge at any one time. 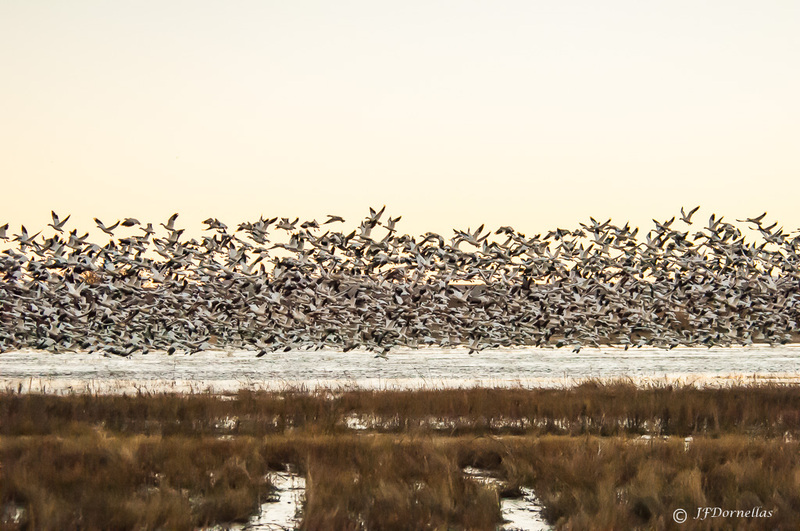 The most exciting spectacle is the sunrise flyout of the birds from their nighttime roost to their feeding grounds. It was a cold morning, arriving at 6:00 AM for a 6:54 sunrise and prior to the flyout the birds make quite a racket and there are several moments when a group will take off and fly around making you think it is the take off but they soon alight back on the water. When the moment comes it is spectacular when it seems that on some signal all of the birds, in unison, rise from the water and take off for their daily feed (see below) and it lasts for only about 30 seconds. This entry was posted in Landscape Photography on December 16, 2014 by admin.